Miftaahul Uloom Academy offers an accelerated Quran memorization program to students who desire to memorize the Quran before moving on to higher education. It is truly an honor for students to be chosen by Allah as one of the Notable Bearers of Quran. The Prophet Muhammad (May Peace and Blessing Be Upon Him) states about the one who memorizes Quran: “Read, recite, and elevate like you use to recite in the physical word because your place (in Paradise) will be at the last verse that you recited” (Abu Dawud & At-Tirmidhi). Parents play a critical role in assisting their child to accomplish this dignified status in the sight of Allah. Consequently, parents will be honored in the Hereafter because of their commitment to overseeing their child’s progress of memorizing the Quran. The Prophet Muhammad (May Peace and Blessing Be Upon Him) honors these parents by saying about them: “Whoever recites the Quran, memorizes it, and acts upon it then on the Day of Judgement he/she will be crowned (by angels) with a crown of light whose light is like the sunlight and his/her will be clothed with two garments better than the whole world and whatever it contains.” (Al-Haakim). In addition to memorization, students will be offered skills that will help their memorization such as the Rules of Tajweed and Beautification of the Voice. 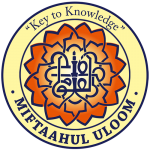 Miftaahul Uloom Academy also implements a Five-Step Review Process that helps students retain what they have memorized. The morning session will be held from 7:00am to 7:45am in the masjid. The regular session will be held during students’ scheduled Quran class; students will report to the Hifz teacher in the masjid. The afternoon session will be held from 3:10pm to 4:00pm in the masjid.